TELEMEDICINE: IS THERE ROOM FOR COMPROMISE? For the past three years, Paul H. Singer, MD, a neurologist on staff at a small community hospital in an affluent suburb of San Jose, CA, has been receiving a stipend of $400 for 24 hours of stroke call, alternating the coverage with the other two neurologists. The hospital CEO is now considering replacing them with a teleneurology service for emergency room (ER) call. The administrator argues that emergency room (ER) doctors are reluctant to bother their colleagues, and thus fewer consults — and potential admissions — are being seen. According to the administrators, with a teleneurology service every potential neurological ER patient could be seen. Using telemedicine, patients and their data are evaluated through a high-definition video link and neurologists make treatment recommendations from their offices and homes. Since the initial proposal to use telemedicine for stroke in 1999, its application has been growing at a staggering pace, with improvements in both technology and delivery networks. Research has shown that telemedicine is valid, accurate, and reliable. Initially intended to address the shortage of neurologists outside of metropolitan and urban sectors, its recent expansion into mainstream use may be a reflection of such success and a consequence of tightening economic pressures on hospitals. But how and when to use the service is a matter of much discussion. At the crux of the debate lies the question of relative quality. Neurologists, already feeling devalued by regulatory changes, increasingly lament the commoditization of medicine and perceive the assumption by bean counters that video interactions can provide the same service as human encounters as yet another affront. In 2006, Neurology Today first reported that few neurologists had succeeded in negotiating payments for call coverage (See “Stipends for Stroke Call Create New Pressures, Demands on Neurologists,” April 4, 2006.) 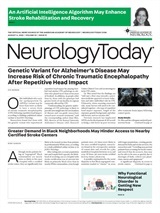 Four years later, and bolstered by an AAN policy statement supporting reimbursement for the service — www.aan.com/globals/axon/assets/2502.pdf — call stipends are far more common, and their potential rescission, argue some, serves as one more blow to the financial viability of practicing neurologists. Neurologists in other parts of the country feel that they're being placed in similar predicaments. Mercerville, NJ, solo neurologist, Scott M. Weaner, DO, who watched his hospital's neurologist staff members dwindle from 12 to four in two years, is among them. When the administration proposed using teleneurology during nights and weekends, Dr. Weaner and his colleagues suggested that rather than pay for this service, the hospital would be better served by paying the staff neurologists to do the call, both for stroke and for service. Dr. Weaner estimates that the cost of teleneurology, based on the admission rate of the hospital, would roughly equal $450 per day, the amount he has proposed as a stipend. If they refuse to accept the offer, he would be in favor of pulling out of call. (They are awaiting a formal response to this proposal). Leonard D. DaSilva, MD, a former neurohospitalist in practice since 2002, has been serving as director of neurology for Specialists On Call (SOC), the largest and busiest teleneurology practice in the United States. The company covers over 100 facilities —from small rural hospitals to large suburban hospitals — located throughout 10 states. Forty-six neurologists, both private practice and academic, have been employed to answer their calls, five full-time, and the rest part-time, working a minimum of 32 hours per month. Fully outfitted with SOC video equipment and laptops and credentialed by their hospital clients, they perform around 1,000 consults a month, 30 percent general neurology and 70 percent stroke. The frequent general neurology cases involve encephalopathy, seizures, intracranial hemorrhage, and migraine. The clients pay a one-time contracting fee that covers installation, training and credentialing, and the monthly fee is based on a combination of factors including the number of beds, ER volume, and acuity, with the average 150-bed hospital paying about $8,000 per month. Mitchell J. Rubin, MD, who practices neurology in a five-person group in Lumberton, NJ, works part-time for SOC as a medical director and covers shifts. He is credentialed in 95 hospitals and licensed in nine states. The company provides malpractice coverage for medical errors and technology failure, but has yet to undergo a lawsuit. The neurologists all participate in quality assurance, and every tenth consult is randomly selected to be reviewed by peers. “Nevertheless, there's no way that teleneurology will replace a bedside neurologist,” Dr. Rubin insists. “We are wonderful at stroke care and can reproduce an NIH stroke scale well, but there are any number of things that we can't do as well as in person. …I can't examine reflexes, do a sophisticated sensory exam, or adequately evaluate a comatose patient,” he said. Although at an average of $267 per day day for a 150-bed hospital, the fee is less than the average on call stipend, neither Dr. Rubin nor Dr. DaSilva have observed a situation in which their services have supplanted neurologists for purely economic reasons. “We're contracted by the hospitals because they don't have neurologists on staff, or because their neurologists have not agreed to take call, or because they weren't responding in a timely manner, and the hospital was unable to achieve stroke center status or maximize potential tPA patients,” explained Dr. DaSilva, who reports that their guaranteed response time is within 15 minutes. The hospital clients are free to call as many times as they like as part of their monthly fee — the company does not bill patients — while their physicians continue to charge their regular consult fees. For example, he said, one hospital in southern New Jersey, which has not had a neurologist on staff for five years, is one of their busiest clients and among the highest tissue plasminogen activator (tPA) providers in the entire state. SOC helps triage the patients and hospitalists generally take over their stroke admissions in the morning. “It's a win-win situation for everyone,” Dr. DaSilva said. “In most situations, even when neurologists have resisted our arrival, within a short time they recognize the advantages. They don't get interrupted in their offices, they can come in after hours and still get paid,” he explained, adding that typically as the local neurologists' business increases both in the office and in the hospital, they change their tune. David A. Nye, MD, a general neurologist who has been practicing almost 30 years at a large multispecialty clinic in Eau Claire, WI, foresees an ominous future. “Certainly having a neurologist ‘on the ground’ is preferable, and those of us working here would prefer not to be displaced, but money drives policy, so we should, like good futurists, consider the repercussions,” he said. “We tend to think of telemedicine as a way for referral centers to reach out to outlying areas, but economically it makes more sense for it to be occurring between hospitals in the US and physicians in other countries where the cost of living and the salaries physicians can expect are lower,” he pointed out. For now, Specialists on Call is responding to the demand, projecting more than 12,000 consults and over 800 tPA cases in 2010. Their clients have found the service to be so successful that they've requested other specialists at their hospitals, and the company is now adding telepsychiatry, telepediatrics, and teleorthopedics to this Brave New World menu. Neurologists are concerned that telemedicine – originally conceived to provide better access to stroke services in rural and inaccessible locales – may be used to cut costs and neurologists' jobs. Salt Lake City neurologist Robert A. E. Summerfield, MD, and five others at one of his hospitals, were able to negotiate a call stipend of $1300 per day with the hospital CEO four years ago, promising to work towards the goal of a comprehensive stroke center and not to see outpatients on call days. Since then, the hospital has had many more admissions for stroke and for other neurologic diagnoses as well. It's been so successful that their CEO recently gave them a raise and suggested that they themselves offer telemedicine to outlying hospitals without neurology coverage with their hospital acting as a hub. “In our situation, we were able to set up an arrangement that was to our liking because we acted as a group and we stood our ground,” Dr. Summerfield said. Telemedicine is increasingly being provided by mobile robots these days, with companies expanding their services from telestroke to general neurology, even at hospitals with neurologists on staff. For more on this topic, read “Sending Robots to Do a Neurologist's Job” in the upcoming issue of Neurology Today. Demaerschalk BM, Miley ML, Bobrow BJ, et al. Review: Stroke telemedicine. Mayo Clin Proc 2009;84(1):53-64. Erratum in: Mayo Clin Proc 2010;85(4):400. Neurology Today10(15):1, 11, 12, 13, August 5, 2010.